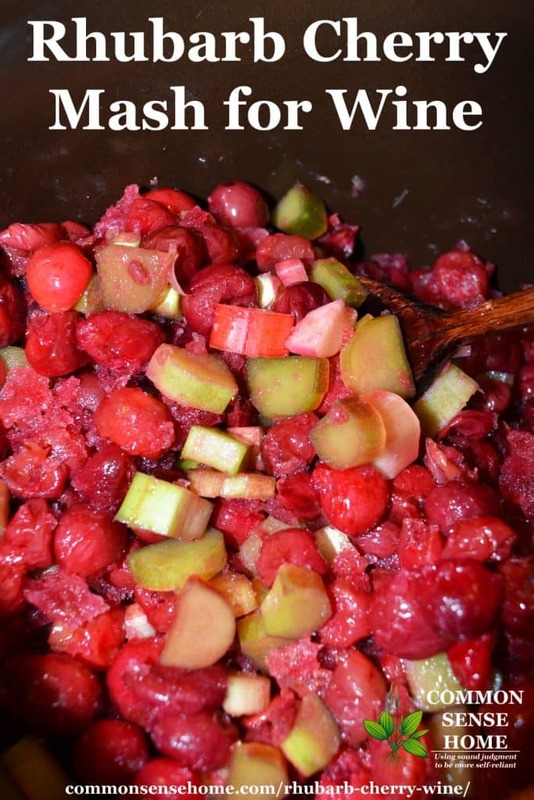 When rhubarb is abundant, I like to use it in recipes like rhubarb pudding cake and rhubarbade, but I hadn't tackled rhubarb wine. 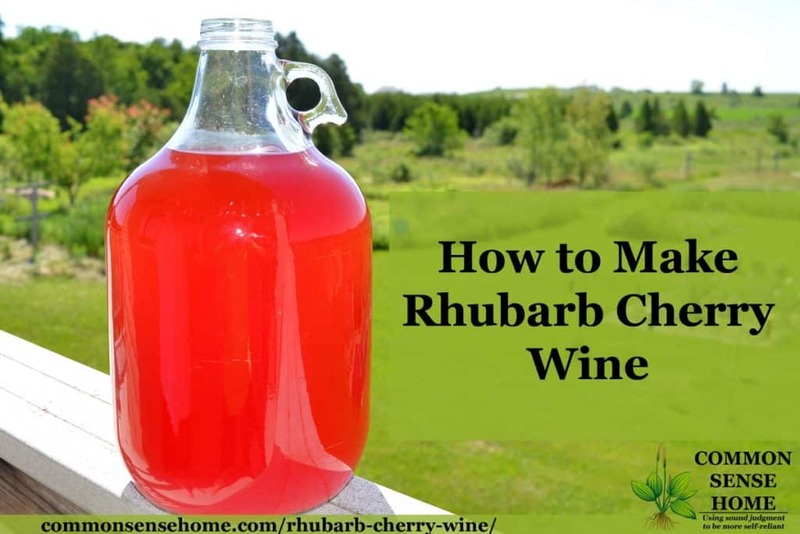 When looking through my favorite old school winemaking book, I came across a rhubarb cherry wine recipe that looked like a perfect combination to use the rhubarb harvest and the stash of Door County cherries in my freezer. (You could use canned cherries, but the color won't be as bright.) 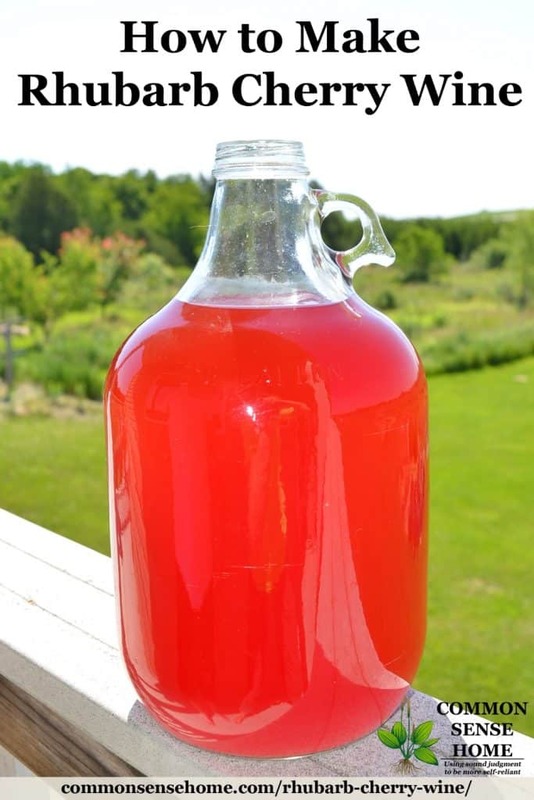 I think it's fun to add some color to a basic rhubarb wine recipe, too. 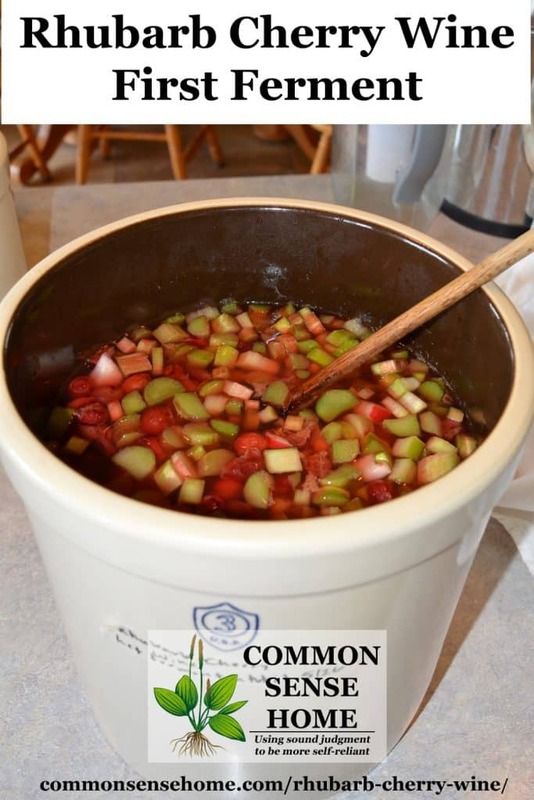 Combine chopped rhubarb and stemmed cherries in a crock or large non-reactive kettle. (Minimum 3 gallon capacity recommended.) Note: If using frozen cherries, partially thaw and combine with rhubarb immediately for best color. Do not allow to thaw completely and sit around, or they will oxidize and the color will fade. Add 4 quarts of water, cover with a flour sack towel to keep bugs out and put in a warm location to ferment for two weeks. Stir daily, crushing fruit against sides of crock. If you don't use pitted cherries, don't crush the pits while brewing. They would make the wine bitter. During this time, the wine may develop a white layer of bloom from the natural yeasts in the fruit. This is nothing to be worried about. You can skim it or stir it in. 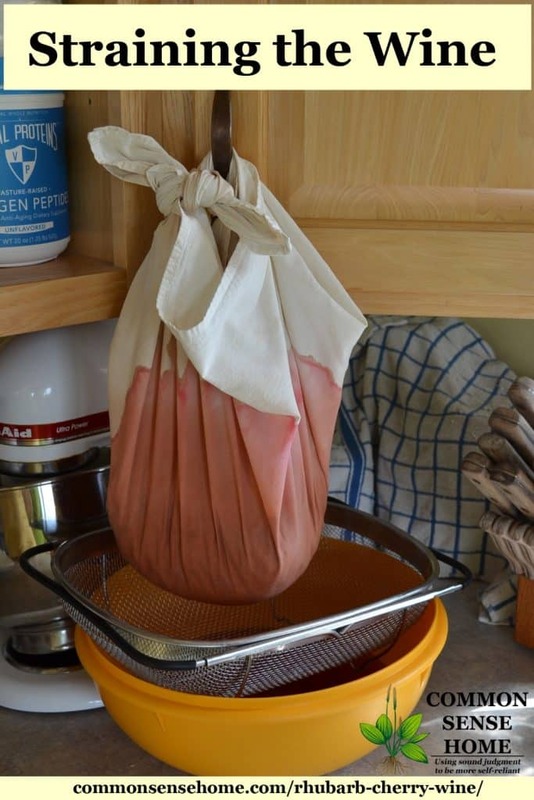 At the end of two weeks, strain fruit mash through a jelly bag or flour sack towel. Squeeze until very dry. Return liquid to crock and stir in the sugar, making sure it has dissolved completely. Dissolve wine yeast per package directions, stir into sweetened juice mix. Cover and ferment for 2 more weeks, stirring twice each week. After the end of the second two weeks, strain through several layers of cheesecloth or a flour sack towel. Juice mix will likely be very cloudy and yeasty, so you should return it to the crock, a carboy or 2 gallon jugs and allow it to settle for 2-5 days. When the wine has settled, siphon into clean, sterilized bottles and cork lightly (or cover with balloons). When you are sure fermenting has ceased, cork tightly. Store for at least one year before drinking. Note: Cane sugar is preferred over beet sugar because it does ferment differently. Given that can sugar producers have started using glyphosate at harvest time to promote more even die down and increase yields, I buy organic cane sugar in bulk to avoid RoundUp™ contamination. Have You Tried Your Hand at Wine Making? Have you tried making homemade wine? If so, what's your favorite? Most of my wine making results from an excess of produce in need of a long term home, our pear wine, but once in a while I try something just to see if it cane be done, like quackgrass wine. We're not big wine drinkers, but we enjoy an occasional bottle and share them as gifts. 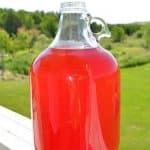 Rhubarb cherry wine is an easy country wine that combines two abundant local ingredients – rhubarb and tart cherries – into a bright and fruity homemade wine. Add 4 quarts of water, cover with a flour sack towel to keep bugs out and put in a warm location to ferment for two weeks. Stir daily, crushing fruit against sides of crock. If you have not seeded your cherries, don’t crush the pits. They would make the wine bitter. Cane sugar is preferred over beet sugar because it does ferment differently. If you don't use pitted cherries, don't crush the pits while brewing. They would make the wine bitter. I started with dandelion, after a conversation with a grocery check out guy. The idea of giving a yellow homemade something as Christmas gifts to family seemed great fun. It was such a hit, they expect it yearly. Then I tried violet, as we had an abundance in our yard. Dandelion seems to hold up better over time. I cracked open a 6 year old bottle of dandelion wine recently, and it was still very good. I would suspect the flavor of violet wine would be more delicate. So happy to have something else to do with all of that rhubarb besides pies! Can you use sweet cherries? I have dark and light sweet. I’m short the full 4 quarts of rhubarb. Would that be an issue? I’m sure it would ferment, it would just change the flavor profile. I can’t imagine sweet cherries tasting bad, they just tend to be more expensive. Cherry season opened here today so I picked 4 4 qt. baskets of dark and light sweet. Sours aren’t ready yet. Trying to weigh whether I should wait or use the sweets and experiment. Would you use the same amount of sugar? I might cut the sugar a little, but not too much, as the rhubarb is so very tart. The sugar feeds the yeast beasties, so you don’t want to cut it too much. Freezing breaks the cell walls and improves liquid extraction. Yes, frozen rhubarb works for making wine. Most commercial yeast packets can handle up to 5 gallons of wine, so likely no need to triple the amount of yeast. If you’re aiming for a specific flavor profile, the natural yeast bloom can be problematic. I don’t mind getting a little variation each time around. It makes the fermenting more interesting to compare different years. This does tend to be a drier wine, so you may want to add extra sugar if you like a sweeter brew. One more note – I know folks nowadays have lots of home brewing options, but I figure that people have fermented things for a very long time without all the different additives. If you want a really “back to basics” approach to wine making, check out “Wild Winemaking: Easy & Adventurous Recipes Going Beyond Grapes, Including Apple Champagne, Ginger–Green Tea Sake, Key Lime–Cayenne Wine, and 142 More“. Most of the fruit wines work with fruit, sugar, water, yeast and nothing else. For tips and recipes for wild yeast brewing, check out the books recommended in https://commonsensehome.com/wild-yeast-brewing/. Do you have mold issues in the home? Did you stir daily to rotate the fruit under the liquid? Are you sure it was mold, or was it white bloom? One is a problem, the other is not. Did you use an open crock or closed fermenting vessel? If you plan to do more winemaking and have run into problems with mold, it may be worth it to invest in a wide mouth carboy that can be airlocked during the first ferment, but still allow stirring. You can certainly use a campden tablet to eliminate wild yeast 24 hours before adding the commercial yeast, but most commercial yeasts will out compete other microbes if conditions are right.